GLOBALISATION for China has a completely different meaning to that of whites and blacks. The majority of the Chinese are of the Han ethnicity. This ethnic group is ancient in origin and is closely linked to the Khoi, Pygmy and Mongol, with a small contribution of Caucasian blood from the north. They were confined in south-east, north-east and far-east Asia until a few thousand years ago when they began crossing the Bering Strait to Alaska and the Americas. They became known as Red Indians and added on to the already existent black populace of the Mayans of central or Mesoamerica. These were blacks and so were their depictions on walls, Olmec heads and so on. These were the priests and kings of the land and their dark skin was accompanied by dreadlocks. They were shipped to Europe as slaves and killed by Conquistadors until the use of European prison labour and thereafter African slave labour. The Han race and phenotype remains in places like Alaska. They would again come to the Americas as railway construction workers in large numbers in the 18th and 19th centuries. They also faced racial discrimination and were segregated in American society. 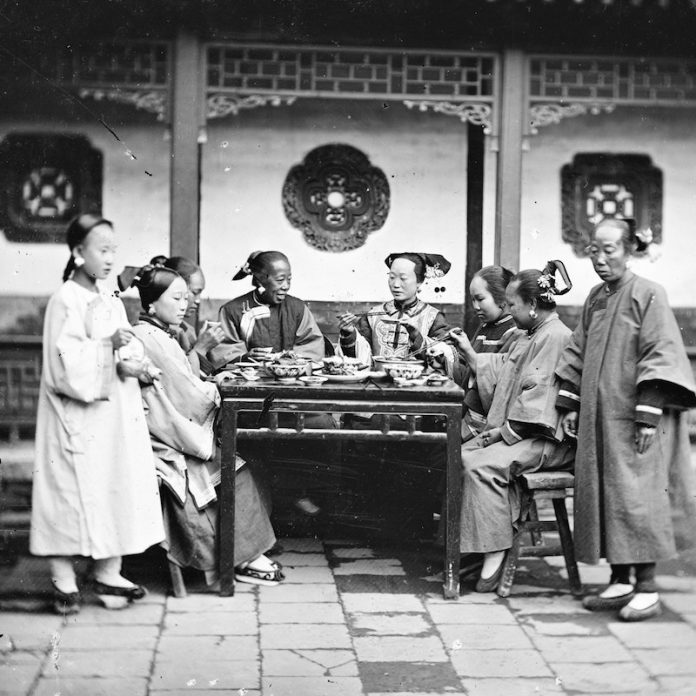 They were prejudiced because of their oriental culture which was deemed too alien by whites; for example, keeping long pony tails and speaking Mandarin. In the area around the Pacific, the Han had always been present and had naval power. The majority of people in south-east Asia are of the ‘O’ paternal DNA marker which is Han or directly related to the Han. They travelled and traded in places like Australia long before the coming of the whites. After the whites came, the Chinese and Japanese made up a great part of the Australian population and though they were discriminated against in the past, they remain in those places to this day. The Chinese also used to sail to Africa for trade purposes and vice versa. However, there is evidence that more Africans sailed to Asia than Asians who sailed to Africa. Chinese coins were unearthed in places like the Great Zimbabwe. Chinese descendants and ceramic plates can also be found in places like Kenya. During the period of China’s isolation by the West, the Chinese began opening up new markets and relations in Africa. Their presence in places like Zimbabwe began increasing in the 1950s when the parents of individuals like Fay Chung came into the country. They helped train and arm liberation fighters in many African nations. After independence, the Chinese and their kinsmen of North Korea were contracted to build monumental places like the Heroes’ Acre and the National Sports Stadium in Harare. More and more Han people began settling in Africa and after the 1970s, they would spread to the West. Now the Han can be found all around the world. Though whites, blacks and Indians can also be found in all places around the world, they differ from the Han in terms of keeping up organisation, co-operation and patriotism while in the Diaspora. The Chinese have succeeded in establishing their own form of ‘pan-Chinese-ism’. This means every Han person on earth whose ancestry is Chinese is formally recognised by the Chinese Government as a ceremonial citizen though temporarily or permanently relocated to foreign lands. Whites who occupied foreign lands turned them into colonies and subjects of their empires, for example Britain. This was the goal of imperialism and would succeed only at the expense of the host nation and its citizens. Pan-Africanism is patriotism and nationalism centred on the land of Africa from where blacks originate. It differs from imperialism because it is not centered on capitalism and subduing other nations in order to benefit one’s own. It is the dream of many blacks in Africa and the Diaspora to unite, at least in terms of purpose and identity. This is the role of pan-Africanism. The initiative to ties with countrymen out of China starts at government levels and cascades to the Chinese populace. This is because it is the Chinese Government which goes out of its way to recognise achievements made by Chinese individuals in the Diaspora. However, it was genuine nationalism and patriotism for the nation of China which triggered this ‘pan-Chinese-ism’. During the time of China’s invasion by Japan, Chinese people in foreign lands helped those in their homeland with money, logistics and even troops. They helped represent China on international forums and thus fought for her liberation. This was the birth of the ‘Huaren’ nationality. Huaren basically means Chinese people in lands besides China. They are proud to be Chinese and remain patriotic as well as productive citizens in their new host countries. Besides the West and Africa, they can be found in Singapore, Malaysia and Indonesia in large numbers. Unlike white settlers, their presence has made several positive contributions to the regions they occupy. The Chinese also have a strong brotherhood centred on their identity, culture and tradition. They observe Chinese festivals like the Spring Festival (Chunjie) even though they will be located thousands of kilometres from their homeland. They stick to their cuisines and make a living off selling Chinese products to foreigners. They also protest when China is slighted diplomatically and partake in boycotts that the Chinese Government initiates. The most obvious sign of co-operation among Chinese people in the Diaspora is the establishment of zones where Chinese products and restaurants, among others, can be found. These are known as China towns and ensure that the Chinese have access to their food and medicine even in foreign lands. They are also known to bank their foreign earned money in Chinese owned banks or go as far as smuggling it back to China. Before the full emancipation of previously enslaved blacks in the Diaspora is realised through receiving reparations and repatriation from the former slave masters and colonisers, a mental and cultural return to the motherland, now known as Africa, is necessary. If blacks learn from the Huaren system of the Chinese, pan- Africanism can truly be achieved and so can the unity of blacks all around the world.